little lambsie divey: 201st post! I just happened to notice that this is my 201st post! Since starting this funny little blog (and amazing new career) 3 years ago, I have posted two hundred times! In celebration of that time, I would like to give you this advice: wear sunscreen. Kurt Vonnegut didn't tell MIT grads to do so... The American Cancer Society highly recommends it... and as someone with fair skin who spends a LOT of time outside, I also feel it is important! 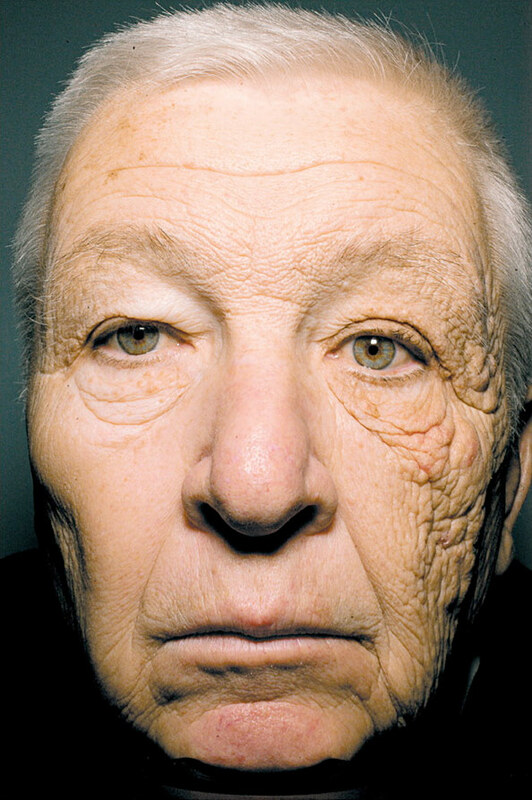 This 69 year-old man drove a truck for 28 years, exposing the left side of his face to the sun (through the truck window). The right side of his face was not exposed to the sun... WOW! According to the New England Journal of Medicine, he suffers from unilateral dermatoheliosis. Sunscreen is recommended to lessen further damage... and probably should have been recommended 28 years ago! big, green, but not a hornworm! get 'em while they're small!